As promised, I followed up my test of various bench flours (homemade rice flour, semolina, cornmeal, and plain old whole wheat) with a test of two things that are not bench flours but certainly help moving the pizza from the peel to the stone. I put my dough on top of tin foil or parchment paper before putting it on the peel and let slide onto the stone easy as ever. Either of these surfaces is far superior to any flour for ease of transfer, but in principle could alter the heat transfer between the dough and the stone resulting in inferior crust. 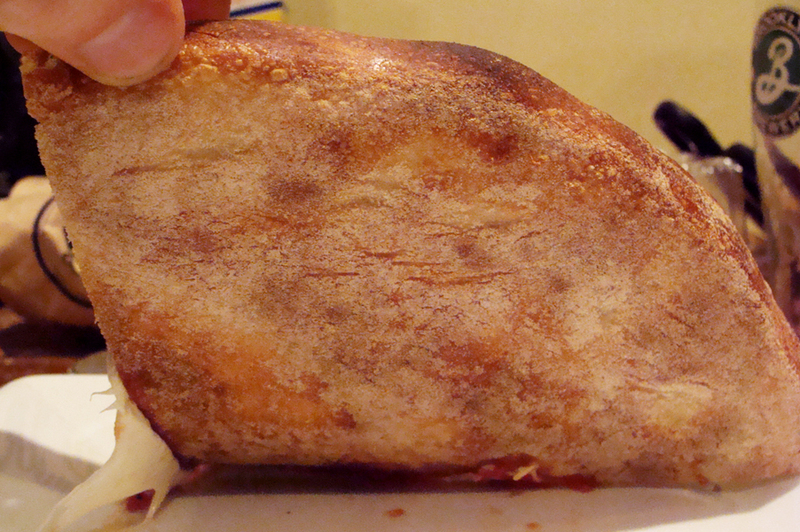 Even with the intervening parchment, the crust is as spotted as I’ve ever managed on my tiles. However, I basically found no such effect. Even with the foil, which seems to be regarded as the poor man’s parchment by many home pizzaiole (possibly due to concerns about conductivity), I couldn’t tell a lick of difference. 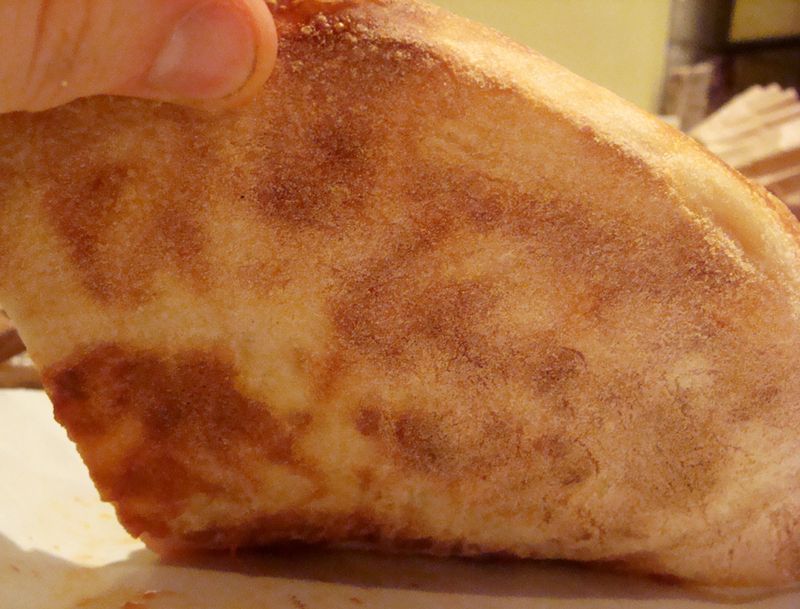 The only caveat to these results is that after a few minutes when the dough is firming up, I opened the oven and used the peel to take the paper or foil out from under the pie. This is especially recommended for the parchment, which will begin to char in the high heat of the oven. Foil seems no different than parchment, but at a fraction of the price. Another interesting result from this particular round of tests was that the foil and parchment didn’t save very much flour from coating the crust. It seems that most of the flour that ends up on the finished crust comes from working the dough into shape rather than when moving the pie from the peel to the stone. This is basically in line with my experience in round 1, when I noticed that when using the semolina or corn meal, there was no noticeable coating from either on the finished product. In conclusion of these two sets of trials, I would definitely recommend starting with tin foil (or parchment paper if you have it on hand, but don’t feel pressed to run out and buy it). It makes transfer trivial, and will serve as good practice until you ultimately decide you’re a purist and use only flour. In potentially more interesting news, I’ve put together a quart of simple must for mead that will hopefully begin to spontaneously ferment soon. No matter the result, it will be interesting to provide a nice home for a lucky family of wild microbes for awhile. Cato, the graduate student who organizes the craic at NYU, recently fermented mead with wild yeast with wonderfully delicious results. Whenever the must becomes mead, I’ll ask him to help me write up a post about it, which will be something fresh to look forward to. This entry was posted in experiment, pizza and tagged review on April 2, 2013 by Dylan Bargteil.